After giving you the first 40 minutes of Owlboy, we can now share a few more videos, shorter this time not to spoil anything. D-Pad Studio may have needed years of efforts to finish the game, but it was clearly worth the wait. Time flies so fast when playing Owlboy, and not just because the main character himself can fly. In this new platformer, in which you'll spend more time in the air than on platforms per se, you play the role of Otus, a young owl who isn't particularly appreciated by his peers. After being assigned to watch the surroundings of their village to prevent a pirate attack, Otus finds himself in the middle of what is going to be a far greater adventure than what he could have ever imagined. To help him in his quest, the young owl has a few abilities of his own (he can fly, carry things/characters, he can launch a simple spin attack or use a sort of dash to go faster), but he needs companions to be able to get past the many dangers he has to face. 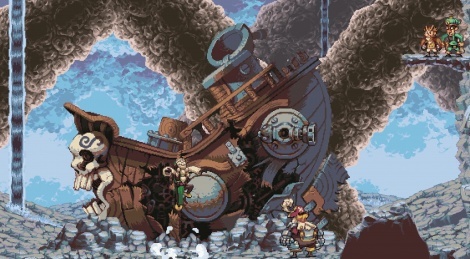 Geddy is the first character to join him, making it possible to shoot down enemies thanks to his precious gun (which gives Owlboy a sort of twin-stick shooter vibe). Then comes Alphonse and his powerful shotgun, which allows you to get rid of the plants that are in your way. We won't say anything about the other companions, as we wouldn't want you to get spoiled. Switching from one companion to the other is very simple, since all you have to do is press the LB/RB buttons. Otus can teleport his friends at his feet immediately, so you'll never have to worry about where you leave them, or even if they are in danger, as they cannot be killed. Some enemies force you to combine the spin attack with the firearms of Otus' friends, while others can also be defeated by throwing water onto them. When attack is not a viable option, Otus has to sneak his way through an area, or sometimes even run away while chased by some gigantic monster, as shown in the fourth video. Owlboy is not only about combat though, so expect puzzle-solving to be part of the equation when trying to reach the exit of a temple. One of the game's main strengths is its ability to regularly throw new situations at you and to propose much variety during the 7 to 8 hours required to reach the end. Because of all that, D-Pad Studio's title really is a worthy heir to the Japanese games of the 80s/90s, like Zelda and Metroid to name but two. Apart from the main quest (which is quite a chatty one), there are obviously secrets to find, which should make completionists happy, as well as all the fans of the genre - who should definitely not miss this game. Like we said before, the game's visuals are a treat for sore eyes, and we love the fact that the developers decided to stick with a pixelated art style. Animations are just as amazing, characters and landscapes alike, and the icing on the cake comes with Jonathan Geer's soundtrack, which you can even get for free if you buy the game on the Humble Store.